“For I will restore health to you, and your wounds I will heal, declares the Lord,” (Jeremiah 30:17). Raising a child or adult with an intellectual disability can be a daunting and an exhausting task. There are many appointments to keep. Finding and funding the needed support services can easily overwhelm families. Family members must cope with the daily stress of seeing their loved one struggle. Encourage family members to connect with community support groups. Within each person’s community, there is a variety of programs and services available. Many of these services are designed to assist people with disabilities. Some of these services are specifically intended for families and other caregivers. The particular array of services available in any given community varies widely. Support coordination specialists (case managers) ensure service recipients receive the proper mix of services. Encourage your loved one to contact their local county services office to locate these services. Encourage loved ones to seek out respite services that may be available in their community. These services are available to caregivers of intellectually disabled citizens. Respite services give families a chance to take a break from their daily care responsibilities. It is very helpful and refreshing for family members to take some time off. Most respite programs are provided through national organizations. The most well-known organizations are The Arc and the Easter Seal Society. Services may also be available through schools, churches, and other non-profit groups. Families are usually allotted up to four weeks of free respite services each year. 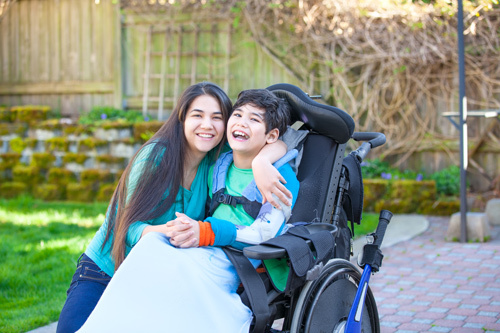 Donate your time and do respite care for a member of your congregation or someone you know in your community that has a loved one with a disability. Seek out organizations that work with the disabled in your community that you could partner with. Donate to your state Special Olympics or volunteer your time working with the athletes. Hold a special event in your community to bring awareness about your local organizations that offer services for those with disabilities. Publicize your event in your church bulletin and local newspaper. Personally invite family members from your church or community who have precious ones with a disability. Be sure to hold your event in a location where restrooms and water fountains are handicap accessible. The location should be in a one level building or a building that has an elevator. Make sure if you have anyone who is blind to find a building that has braille written on the walls. Be sure to hire an interpreter if you have anyone who is deaf. Apply for Thrivent Action Team monies to help support your event and bring recognition to your local organizations. Dear Heavenly Father, we thank you for creating us and choosing us to be your dear children. We pray for those special people in our churches and communities who have great needs or disabilities. We especially pray for their families and caregivers as they care for them, may you grant them strength and patience during this difficult time. Please encourage us to help those with disabilities and to see the opportunities you give us to help those who are suffering with an illness. In Jesus precious name we pray. Amen. The Gospel Outreach Committee would love to hear about and share your mission service activities! Please contact us through the LWML email at depgo@lwml.org. Thank you!